A couple months before Christmas, The Girl started talking about nothing but Monster High. She and the neighborhood girls seemed to suddenly discover Monster High and wanted the Monster High dolls. They even "assigned" each other Monster High characters that they would act out when they played. Even now, with Christmas behind us, the selection of Monster high "stuff" available seems to be limited. At the time I just thought, "Oh well..."
It's funny sometimes how you wind up finding things. The links on the internet are kind of like the thought process people have when they start at one idea and end up at a completely different idea. I found a link on Pinterest to a tutorial on how to make buttons made with Shrinky Dinks. I have never before worked with Shrinky Dinks. I always thought it was neat but I also always associated it with Christmas ornaments. So out of curiosity more than anything else, I followed the link to the button tutorial. It was a great tutorial and the buttons were cute, but I don't need buttons. I didn't even begin to dream up the possibilities of Shrinky Dinks. Then I found a link to a freezer paper stencil tutorial. I thought I could make a Monster High stencil using freezer paper and stencil a t-shirt or something. Searching online through Monster High images (trying to find a good one to make a stencil from), I came across a Monster High necklace and earring set...made from Shrinky Dinks! Oh, now I can see the possibilities! 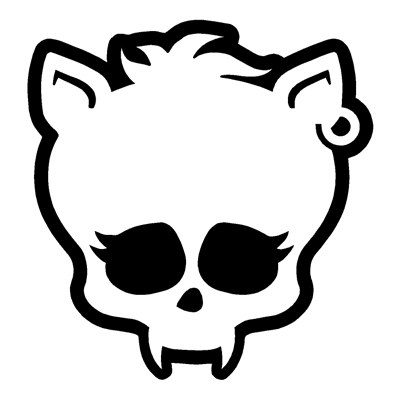 Since The Girl's favorite Monster High character is Clawdeen (a werewolf - with Spectra and her pet ferret coming in a close second), I decided to try the Shrinky Dink process by making her a pair of simple earrings in the shape of Clawdeen's "skullette". The Girl had saved the box her Monster High dolls came in and had been tracing the images from it for her little art projects. I planned to use those same images for this project. I traced the skullette onto the Shrinky Dink plastic (I used the frosted sheets), then cut the image out (I made two of them) then punched a 1/8" hole at the top. Into the oven they went. I stuck around the oven for a bit to see if I could see them shrink, but after about 30 seconds I walked off. Two minutes later, I came back to find the images shrunk down so tiny! And they looked GREAT! I became hooked! The project possibilities are filling my head now. I have a feeling The Girl and I will be making all kinds of Shrinky Dink charms this weekend! Update: We wound up making lots of Monster High earrings (dangles and clip-ons) for The Girl's friends using each of their favorite character's skullettes - and even a larger Lagoona necklace for the one friend that couldn't wear earrings. Here is one we had left over (Frankiestein) that is a bit too "grown up" for 8 year old girls. Update 04/01/2014: Check out this Monster High Shrinky Dinks Chandelier project I found at Toys R Us. It's AWESOME!